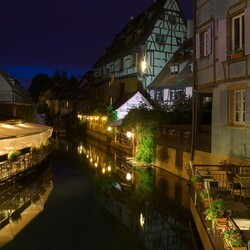 "The Little Venice" is the name given to the river from Colmar, La Lauch. This name comes from the alignment of houses from both sides of the river which serves the southeast of the city. This area starts behind theKoïffhus, through the platform of the fish, until Turenne St. Peter bridges. It is also located at the beginning ofthe "Krutenau", whose etymology means venues of market gardening around the cities. Originally inhabited by a rural community of winemakers, growers and boatmen, Krutenau stretches around the street as MarshalTurenne borrowed in 1674 for his triumphal entry into the city. boat ballads are possible in this sector. 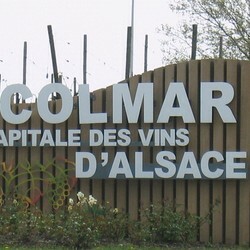 Symbol of the Epicurean Alsace The Wine Route meanders nearly 170 km vineyards. 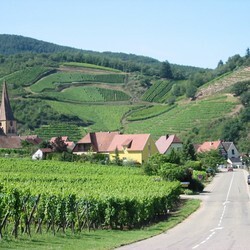 From Thann toMarlenheim, the Alsace Wine Routewill offer you picturesque villages, famous wine towns and offersbreathtaking panoramic views that illustrate the richness and diversity of the alsacian Terroir. Between plains and mountains, Alsace is full of villages with matchless charm. Many of these picturesque steps can claim the label of "most beautiful villages in France" or "Most Beautiful Detours in France". 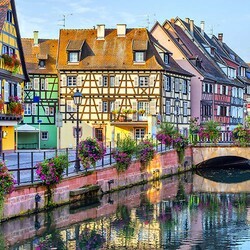 Riquewihr,Kaysersberg or Eguisheim, medieval villages nestled at the foot of the Vosges and located less than 15 km from Colmar are essential steps on the Wine Route. 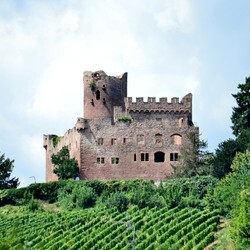 Alsace is one of the European regions with the most castles. Now in ruins for most, their silhouettes are part of the Alsatian countryside along the Vosges. Their visits are an opportunity to beautiful walks that take us backinto the mysterious world of the Middle Ages. Here are three of the most prestigious castles of our region. 800 meters high on a rocky outcrop, the castle offers a panorama of the Alsace plain, the valleys and the Vosges mountains, the Black Forest, and on a clear day, the Alps ... Built in the twelfth century, the castle was for centuries a witness to European conflicts and rivalries between lords, kings and emperors. He sees a succession of illustrious owners, including the Habsburg dynasty and the German Emperor William II. 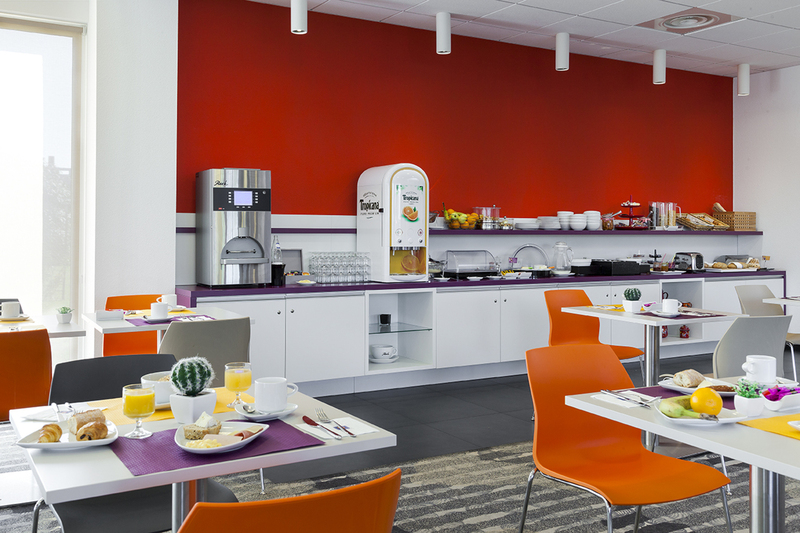 Built on top of a mountain, the Hohlandsbourg offers a magnificent 360 ° panorama over the plain of Alsace and the Vosges mountains. On clear days you can see the Strasbourg Cathedral Peak and the Bernese Alps. 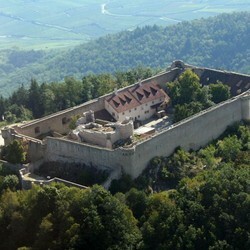 The garrison of the castle, built in the 13th century, was the seat of a lordship of the Habsburgs. 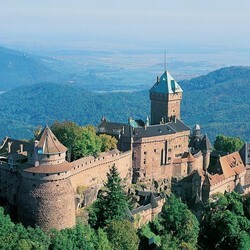 With 100 meters long and 60 meters wide, is the largest castle in Alsace. Kintzheim offers an impressive spectacle and striking: the free flying of the largest raptors in the world in the ruins of the castle. A unique opportunity to closely observe unapproachable birds in nature. In this medieval setting you can watch the most beautiful birds in the world fly only a few centimeters from the audience. Amazing for children and adults!